Yesterday, I wrote that the Mets would avoid the Sports Illustrated jinx this year. In 2009, SI picked the Mets to win the World Series, but this year's prediction was for fourth place. 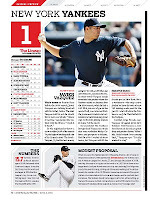 But SI's MLB preview, which came out today, also featured a "player to watch" for each team. For the Mets, that player was Daniel Murphy. Several hours after the new SI hit newsstands, Murphy was diagnosed with a sprained knee and is now out two to six weeks. With Ike Davis waiting in the wings, my friend David has already started calling Murphy Wally Pipp. As far as I know, the other player featured on the Mets preview page, knuckleballer R.A. Dickey, had an uneventful day. Game 3 of WhatIfSports' simulation of a Subway World Series between the 1986 Mets and the 1998 Yankees was a pitcher's duel between David Wells and Sid Fernandez. The 1998 Yankees scored twice in the third when Derek Jeter doubled, Bernie Williams doubled him home and Paul O'Neill singled home Bernie. Those were the only runs El Sid allowed in seven innings. Wells shut out the Mets until the seventh, when Ray Knight doubled home Rafael Santana. As in the earlier games, the computer made some changes to Davey Johnson's usual lineups. Santana, the usual no. 8 hitter, batted seventh, while Knight hit eighth. Keith Hernandez, the usual no. 3 hitter, batted cleanup. Perhaps the computer thought this was the most efficient lineup, but in this simulation, it did not turn out that way against Wells. Fernandez did not start a game in the 1986 World Series, as the Mets used a three-man rotation of Darling-Gooden-Ojeda. Fernandez did get a start in the 1986 NLCS. Jesse Orosco pitched the eighth and allowed a run when O'Neill singled home Williams. The 1998 Yankees now led, 3-1. In the top of the ninth, Derek Jeter singled off Doug Sisk to drive in Chuck Knoblauch. Mariano Rivera set down the 1986 Mets in order in the bottom of the ninth to preserve the 1998 Yankees' 4-1 victory. The 1998 Yankees now lead the 1986 Mets, two games to one. Read the Game 3 box score and game summary. The good folks at WhatIfSports, who run SimLeague Baseball and Hardball Dynasty have run a best-of-seven scenario for us- a Subway World Series, if you will - between the two teams. And each day this week, we'll feature one of the games here at Subway Squawkers. Last year, Sports Illustrated picked the Mets to win the World Series. We know how that turned out. Subway Squawkers got the opportunity to get an advance look at predictions for the locals in SI's MLB preview issue, which comes out Wednesday. "It's hard to envision the creaky Mets, losers of 92 games a year ago, reestablishing themselves atop the NL East without [Ike] Davis and [Fernando] Martinez arriving and thriving as everyday players." This statement could well be accurate, but it does not have much to do with 2010. While I do think Davis could take over first base at some point this season, the same is not true for Martinez, unless Carlos Beltran fails to return or Jeff Francoeur or Jason Bay gets hurt. Nothing Martinez does would likely make up for the loss of any of these outfielders, especially Beltran and Bay. While SI pins the Mets' hopes on two rookies who might well have no impact this season, they say nothing about Jenrry Mejia, who actually could go north with the team. 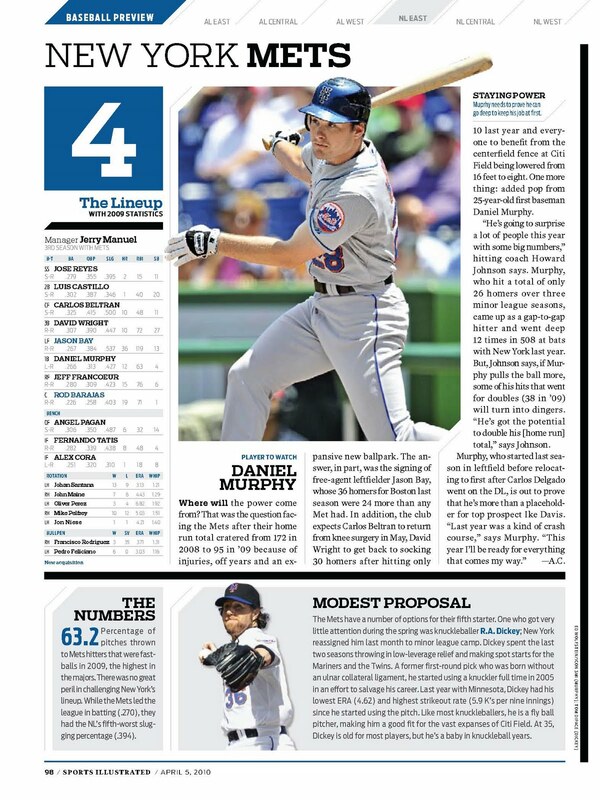 For each team, SI spotlights one "player to watch," and that player for the Mets is Daniel Murphy, an odd choice, considering they are also predicting doom unless Davis takes over at first. SI quotes Howard Johnson as saying that Murphy could double his home run total. Last year, Murphy hit 12 homers. If Murphy hits 24 homers, the Mets will be better off, but with injured stars making comebacks and a pitching staff in disarray, Murphy would not make my top ten of "players to watch." SI also offers a "modest proposal" for each team, and for the Mets, the proposal is modest indeed - consider giving the fifth starter role to 35-year-old knuckleballer R.A. Dickey. The way the Mets' rotation has looked this spring, I can see them giving opportunities to someone like Dickey. But then the season will be like last year, when Pat Misch, Nelson Figueroa and Bobby Parnell ended up in the rotation. Of a 70-win team. One bright note - this year's candidate for the SI jinx is the Phillies. Sports Illustrated picks the Philadelphia Phillies to beat the Tampa Bay Rays in the World Series, saying that the Phillies "have the one element they’ve been missing for a quarter of a century: a big-time winner at the front of the rotation. That would be righthander Roy Halladay, obtained from Toronto in December, whose first trip to the playoffs should end with Philadelphia clinching its second World Series championship in three years." The Yankees could muscle their way back to an October rematch with the Phils, but it would require the same off-the-charts good health and production from their older players that they received last year. That means the door is open in the American League for Tampa Bay, which has the deepest collection of young, versatile talent in the game. I agree that the Yankees had a lot of luck last year - and 15 walkoff wins - which is why I'm projecting them to win fewer games this year (my prediction for Heater Magazine was 95 games.) But I still think they'll win the World Series. At any rate, though, I'm relieved that SI didn't pick them, given the dreaded Sports Illustrated jinx! Don't believe in it? Look what happened to the Mets last year, after SI picked them to win the World Series! The magazine also has a nice little piece on Alfredo Aceves, praising his pitching and saying that the "Yankees should find a bigger role for him, either setting up Mariano Rivera as a multiple-inning reliever or as the fifth starter." Gee, I hope this article doesn't somehow jinx Ace; he's one of my faves! As for the Mets, unlike last year's audacious prediction, when SI predicted them to win the World Series, Si projects the Mets to finish in fourth place and win just 79 games. Given the way last season was such a star-crossed one for the Mets after that prediction, maybe it's just as well the Mets are ranked so low! But even I think that they'll finish above the Marlins. In SI's NL East scenario, the Mets are ahead of only the Nationals! Daniel Murphy is SI's Met player to watch, with hitting coach Howard Johnson saying that Murphy is "going to surprise a lot of people this year with some big numbers." 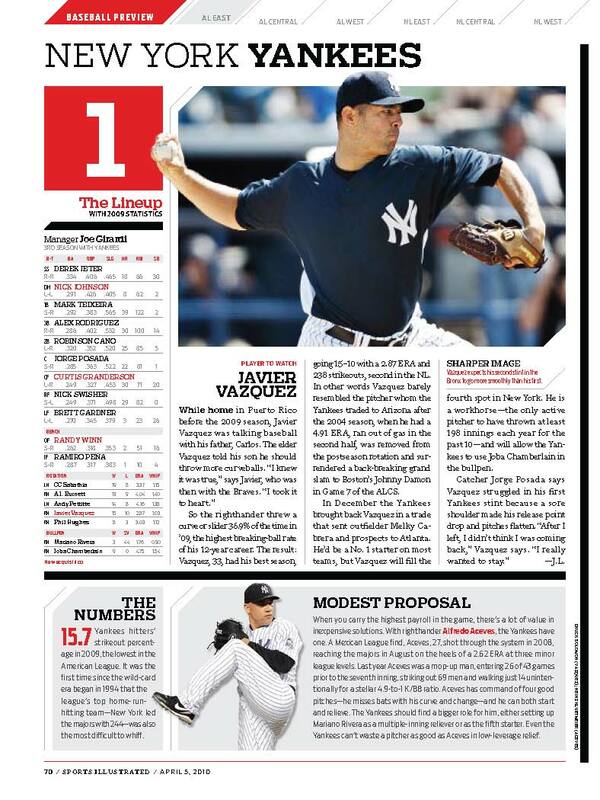 Sports Illustrated also thinks the Mets should take a chance on R.A. Dickey, the knuckleball pitcher. Me, I think the Mets ought to re-sign Pedro Martinez, the pitcher some would say is a knucklehead! But that's me - Pedro returning to Flushing would immediately give me something Mets-related to squawk about every five days. Anyhow, Sports Illustrated's MLB Preview issue will be on newsstands today, and I'm sure there will be plenty of other stuff to rehash - and squawk about - in the issue. For one thing, I'm curious to read what they say about the Red Sox, and why they're ranked in third place. I have them getting the wild card in the predictions I did for the Baseball Bloggers Alliance - more on that soon. I was afraid this would happen. Six months after being fired from ESPN for screwing around in the workplace, Steve Phillips has gotten a new job. The former Mets GM will be talking baseball with Mike Francesa's WFAN show once a week. Good grief. It really ticks me off that Phillips has gotten a high-profile job on the biggest sports radio station in the country so soon after he got fired for cause. What kind of message does that send? What bothers me isn't that Phillips messed around in his marriage - that's between him and his wife - but that he did it in the workplace. Not to mention that he's not a very good baseball broadcaster in the first place. Of all the knowledgeable voices in this town, he gets a gig at WFAN? Why? Anyhow, I wrote a rant on this for The Faster Times. Please check it out. In light of recent events, it is bittersweet that WhatIfSports' simulation of a Subway World Series between the 1986 Mets and the 1998 Yankees sends Dwight Gooden to the mound for the Mets in Game 2 of their best-of-seven simulation. But what is truly strange from this Met fan's perspective is that opposing Gooden is none other than David Cone. Cone was not on the 1986 Mets, but joined them the following year in a trade with Kansas City. Here's something that really seems unthinkable today - In 1986, the Royals were defending World Champions. Gooden took the loss in Game 2 of the 1986 World Series, allowing five earned runs in five innings, including homers by Dave Henderson and Dwight Evans. Doc fared better in this Game 2, allowing three earned runs in seven innings, including a two-run homer by Scott Brosius in the sixth that put the 1998 Yankees up, 3-0. But Cone was better, shutting out the 1986 Mets over seven. In the top of the eighth, future Met Mike Stanton came in and promptly blew the lead. Darryl Strawberry reached on an error by Brosius, Keith Hernandez walked and Gary Carter hit a three-run homer to tie the game at 3. But in the bottom of the eighth, Jesse Orosco entered the game and quickly loaded the bases with none out, walking Tino Martinez and Jorge Posada and plunking Chad Curtis. Scott Brosius then hit into a double play, scoring Tino with what would turn out to be the winning run. Mariano Rivera closed it out in the ninth, striking out 1998 teammate Strawberry for the final out. Jeff Nelson, who got the final two outs in the eight, got the win, while Orosco took the loss. The 1986 Mets - 1998 Yankees World Subway Series is now tied at a game apiece. Read the Game 2 box score and game summary. World Subway Series: What if the 1986 Mets faced off against the 1998 Yankees? Who would win if the two most legendary New York teams of the last 25 years - the 1986 Mets and the 1998 Yankees - faced off in a seven-game series? And what role would Darryl Strawberry, who played on both teams, have in the series? I would hope that his appearance wouldn't end with him quitting out of nowhere, the way his tenure on "Celebrity Apprentice" ended last night. Strawberry shocked and dismayed most of his fans watching the show by offering himself to be fired, even though he hadn't done anything worth being fired over. Ostensibly, his move was to save project manager Michael Johnson from getting the heave-ho, but then Darryl admitted to Trump that he was "tired" and just wanted to go home. Oh, Darryl, how could you? You look like a quitter, even though you technically got "fired"! I wish we could do a What If over if Straw had stayed on "Celebrity Apprentice" - I don't think he would have won, but he would have lasted longer than that icky governor! But we can do a What If over how Strawberry's 1986 Mets would have done against the 1998 Yankees. The good folks at WhatIfSports, who run SimLeague Baseball and Hardball Dynasty have run a best-of-seven scenario for us- a Subway World Series, if you will - between the two teams. And each day this week, we'll feature one of the games here at Subway Squawkers. In Game 1, the pitching matchup features Ron Darling over Andy Pettitte. And Strawberry hits a two-run homer to help lead the 1986 Mets to victory over the 1998 Yankees (he didn't play in the Yankees' lineup that night, though.) The '86 Mets beat the '98 Yankees in Game 1, 11-6. Read the box score and game summary here. And come back every day this week to Subway Squawkers to see how this WhatIfSports series ends! How would Dwight Gooden's career have turned out if he had stayed sober? 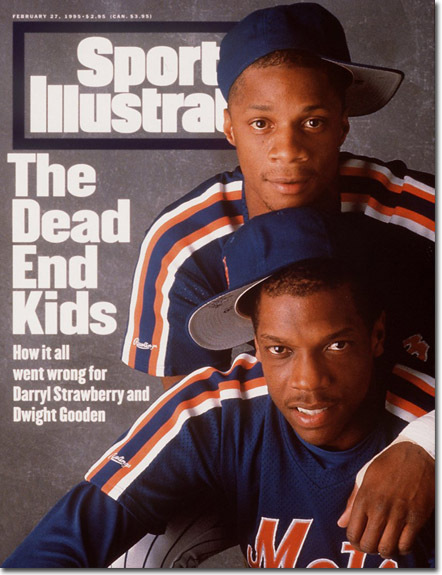 Dwight Gooden and Darryl Strawberry are forever linked in fans' memories, but the players have taken very different paths these days. While Strawberry is a "Celebrity Apprentice" star, book author, and an SNY broadcaster, the only appearances Gooden is making as of late is in the police blotter. Squawker Jon wrote about Gooden's DUI arrest the other day. And Gooden's legal woes got reader Uncle Mike to wonder what Doc's career would have been like if he had never touched drugs and alcohol. So he wrote up an account on his personal blog, Uncle Mike's Musings. In Mike's what-if scenario, the Mets would have more playoff appearances (but no more rings) while the Yankees would have a few more championships, courtesy of Doc's arm. Somehow in this alternate universe, even the horror that was 2004 would have been fixed, with the Red Sox still looking on the outside in. And in Uncle Mike's world, Gooden would be known as one of the greatest Yankee pitchers ever. Quite a fanciful account. The clean Gooden must be a true miracle worker if his actions could result in the Cubs making it to the World Series. 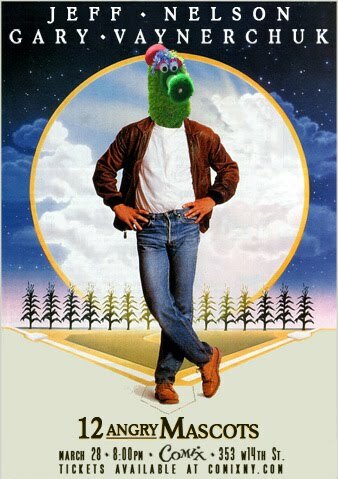 Looking forward to your sequel, "If M. Donald Grant Were Not a Tightwad," in which the 1977 Mets kept Tom Seaver, signed Reggie Jackson and other free agents, and made it back to the World Series under manager Joe Torre while the Yankees had to settle for their brief appearance in 1976 against the Reds. Torre went on to become a New York institution in his many years of managing the Mets. But, as Uncle Mike remembered, the Mets did have the chance to draft Reggie Jackson in 1966, but passed on him and chose the immortal Steve Chilcott instead. Anyhow, our Met-hating reader has somehow conjured a scenario of how, if the Mets had drafted Reggie, he somehow would have cost him that 1969 miracle. Squawker Jon will not be pleased to read this! Speaking of what-if scenarios, we have partnered with the good folks at WhatIfSports to see what would happen if the 1986 Mets faced off against the 1998 Yankees. (Of course, Darryl Strawberry will be playing for both teams!) Anyhow, we have our own World Series of the two memorable teams coming up, starting tomorrow. Come back Sunday and check it out. Shocker! A-Rod turned down "Saturday Night Live" - repeatedly! Buried in today's Joel Sherman's New York Post column about Alex Rodriguez's upcoming interview with the feds about Anthony Galea is one of the more jaw-dropping tidbits I've heard about A-Rod in a while. Sherman says A-Rod "turned down multiple overtures to host Saturday Night Live" this winter. What???? How could that be? Doesn't he know that hosting "SNL" is one of the perks of being a superstar New York athlete? Turning down the chance to host "Saturday Night Live" is like telling Oprah Winfrey, "No thanks, I'd rather not be on your show." It's just not done! You may remember I suggested this winter that Joe Mauer wouldn't get to host "Saturday Night Live" or present at the American Music Awards as a Minnesota Twin. And I got some grief from readers this week when I wrote that I "hope [Mauer] knows that his chances of hosting "Saturday Night Live" are officially kaput! 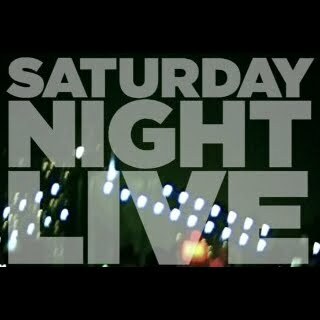 I also actually watched an entire "SNL" episode last November for the first time in ages, in the hope that a Yankee might show up (this was on the Saturday after they won the World Series.) And they had nothing about the Bombers, to my dismay. Given that producer Lorne Michaels is a big Yankee fan who has seats behind home plate, it was weird that there were no Yankee players on the show that night. Then it was reported in a number of places that Derek Jeter was going to host "SNL" again, this time with Jay-Z and Alicia Keys as musical guests. But that gig never happened. I wondered at the time why "Saturday Night Live" would have Jeter on again, given that his hosting gig showed that he wasn't exactly the best athlete actor ever. At any rate, they didn't have him on again, and they couldn't get Rodriguez on for the first time. The fact that A-Rod was so low-key in the media this winter - the only media appearance he made was to introduce his good friend Jay-Z at the American Music Awards - was nothing short of stunning. I would have expected him to be all "Take that, haters!" and been ubiquitous in the media, but instead, he stayed relatively quiet. And as I wrote back in November, A-Rod even low-keyed it at the Yankees tickertape parade, where, with his black hat, black sunglasses and black gloves, it took a second for Yankee fans to even recognize him. And, with Jay-Z along for the ride, he arguably might not have even been the biggest name on his own float. According to Tim Brown of Yahoo Sports, A-Rod, didn't just nix "SNL;" he also turned down Leno, Letterman, and major magazine covers. Alex better not have turned down Oprah, though, or I may never forgive him for that insult! I became a Dwight Gooden fan again after he appeared at the closing ceremony at Shea Stadium. I stopped being a fan around the time he pitched a no-hitter while wearing a Yankee uniform. That was the final straw for a player who should have been the third Hall of Fame pitcher to win the bulk of his games in a Met uniform. (No, I'm not over Nolan Ryan, either.) A pitcher whose two-month stint in drug rehab in 1987 probably cost the Mets a chance to defend their last title. I went to the 20th-anniversary celebration of the 1986 team, but Gooden didn't make it - he was in jail. At the time, Gooden seemed even more separate from the great memories of that era. But when Gooden showed up at the farewell to Shea, it suddenly seemed right. Gooden had let down the Mets, the fans and himself. Now the Mets had finally welcomed him back. The fans had welcomed him back. And Gooden, one hoped, was getting his life back together. Gooden appeared to be doing well enough that the Mets offered him a job as a spring training advisor, but he turned it down because he said he did not want to be away from his wife while she was pregnant. And now Gooden has been arrested and charged with driving under the influence while his son was in the car, unrestrained. What a sad day for Gooden and his family. And what a sad day for Met fans that one of our own is in trouble again. Yes, one of our own. Even while failing to live up to his immense potential, Gooden won 157 games with the Mets - and 24 with the Yankees. Gooden, for better and worse, is once again part of the Mets family, and that's the way it should be. I am thankful that nobody was hurt in the accident today. It will be understandable if the Mets don't offer Gooden any more jobs for the forseeable future. If Gooden is convicted of these charges, he should do more time. But Gooden still belongs in the Mets Hall of Fame for what he achieved on the field, even if this summer's induction turns out to be another ceremony he is forced to miss. 12 Angry Mascots - and one 4-ringed relief pitcher! After retiring from baseball, former Yankee relief pitcher Jeff Nelson has been transitioning to a career in broadcasting - here he is talking about Joe Nathan on the MLB Network. Now he's got a new gig, as he will be appearing at a...comedy club? What? Yes, Nelson, along with wine guru/Jets fanatic Gary Vaynerchuk and comedian Sean Patton, will be part of the latest 12 Angry Mascots sports comedy show, this Sunday, March 28 at Comix comedy club at 353 W. 14th Street, in the Meatpacking District. Tickets are $10 ($15 day of show) and be purchased online or by calling 212-524-2500. A portion of the proceeds from the show will be donated to the NYC chapter of the Cystic Fibrosis Foundation. 12 ANGRY MASCOTS is the Tri-County Area's only variety/talk show devoted to that touchstone of all humankind endeavors: sports. Scott Rogowsky (The Onion) and Neil Janowitz (ESPN) welcome the Eastern Seaboard's finest sketch actors and comedians to mock the jocks and spoof the sports scene in a grand slam-packed show that culminates with a celebrity guest athlete interview. These mascots aren't angry for nothing. Anyhow, if you're looking for something to do Sunday night, check out Jeff Nelson's comedy show debut. It sounds like a fun evening. The latest Mets Yearbook time capsule on SNY was from 1980. It began with the introduction of the new owners. Nelson Doubleday did most of the talking while Fred Wilpon in 1980 looked a lot like Jeff Wilpon today. New GM Frank Cashen said that he thought the Mets would win a pennant but did not know how long it would take. Cashen, also the new chief operating officer, then spoke of the importance of "packaging" the team. At the time, I thought the slogan "The Magic Is Back" was a pointless piece of advertising. But now it evokes for me a time of renewed hope after the dismal late 1970s. Though it was not mentioned of course, the shadow of the Tom Seaver trade hung over the show. Steve Henderson hit a dramatic home run, Pat Zachry was Pitcher of the Month, and Doug Flynn's injury helped derail the Mets' season. Three years after the Midnight Massacre, the three main pieces acquired (along with Dan Norman) for The Franchise were still playing key roles for a team that would fail to win 70 games for the fourth year in a row. Squawker Lisa, as long as you are checking out SNY, you might enjoy this show for a segment meant to embody the spirit of the struggling 1980 Mets - a montage of manager Joe Torre arguing with umpires. The days of green tea and snoozing in the dugout were well in the future. The show was a little misleading when announcer Bob Murphy proclaimed that the Mets had improved 11 games in the standings over 1979. The Mets only won four more games, but the division winner won seven fewer. In 1980, the Mets finished next-to-last, 24 games behind first-place Philadelphia. Last year, the Mets finished next-to-last, 23 games behind first-place Philadelphia. Once again, the Mets try to rebound behind a new slogan. Only "Prevention & Recovery" does not have quite the same ring as "The Magic Is Back." 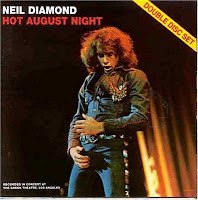 I am on record as despising the Neil Diamond song "Sweet Caroline." I hate it oh so very, very much. It's bad enough that "Sweet Caroline" has become a Red Sox anthem, but then the Mets started using it as their own singalong, which made it even more annoying. Fortunately, I think the Mets finally stopped playing it last year, but this tradition still goes on at Fenway Park. Anyhow, Nick Swisher is in an ESPN commercial with Clay Buchholz, of all people (Hat tip to Sox and Dawgs for the video) and Swisher also has a negative reaction to the song. Here's the scene: Buchholz, actor Adam Scott (whoever he is! ), and Swisher are sitting around the living room together when the first two burst into a "Sweet Caroline" singalong. They try to get Swisher to join in, and he says, "No way, dude." Left unsaid is why Swisher was hanging out with a Red Sox. At the very least, I hope Swish kept his laptop hidden! And I might not have known that was Clay Buchholz in the video if it weren't for the description. He's not exactly Youk when it comes to being recognizable! What do you think of "Sweet Caroline"? Creepy or cool? Leave us a comment! Is SNY blacking out UltiMET Classic episodes? I was watching a little of SNY's "UltiMET Classic" episode last night, while waiting for "Dancing With the Stars" to start. Come to think of it, what's more embarrassing - admitting to watching an old Mets game, or admitting to watching "Dancing With the Stars"? I say watching the Mets! And if you must know, I'm rooting for Chad Ochocinco to win "DWTS." He's got a real star quality about him that's immensely appealing. Anyhow, I digress. Michael in California, one of our readers, told me that he's unable to see any of the Met "Classic" episodes on SNY. He's able to see the channel, just not the old-time games. Get this - he said the UltiMET Classic games are blacked out! What's up with that, Squawker Jon? Is showing Johan Santana attempting to save the 2008 season, before the Mets blew the last game of that year, really so precious that it needs to be blacked out outside of the NYC area? What, is this competing in California with some old Dodgers game or something? I don't get it. So I have two questions for our readers. One is if they've also experienced these blacked-out classic Met games. The second is whether or not the YES Network blacks out classic Yankee games. It's all a big mystery. One other thought - when is "Dancing With the Stars" ever going to pick a baseball player for the show? It's time! Who's better - Jorge Posada or Mike Piazza? Where does Carlos Beltran rank among New York center fielders? And where does Alex Rodriguez rank among New York third baseman? Those are some of the sports questions you can expect to see on "Lineup," MSG's new series looking at New York's "All-Time Best Baseball Players." The series starts Tuesday night at 10:30 p.m. First topic - NY's best-ever catcher. (I'm thinking Yogi Berra has that one sewn up, but it ain't over 'til it's over!) And there's even a way for viewers to get in on the action and win prizes - more on that in a sec. "The Lineup" will look at Yankees, Mets, Dodgers and Giants greats. A blue-ribbon panel, hosted by Fran Healy, will discuss the possible nominees, whittle them down to a five-man list for each category, and then vote on the all-time great for whatever position is being voted on that night. I voted for Yogi Berra, Roy Campanella, Bill Dickey, Mike Piazza *, and Jorge Posada as my top five New York catchers. (And yes, that is an asterisk!) What are your choices? I was having a great day Sunday. Then I heard the big news coming from the Minnesota Twins camp. What are the Yankees going to do without Joe Nathan to kick around, now that the closer is getting Tommy John surgery and will be out for the year. Nathan had become the new Arthur Rhodes, the way the Yankees owned him, and it's a bummer that he's hurt. So I checked out JoeNathan.com, and saw that there's a place where fans can leave "notes of encouragement" for him. I was all set to write something to Nathan, saying that this Yankee fan hoped he made a miraculous recovery just in time for the playoffs, but Squawker Jon told me not to do it. Anyhow, if that weren't bad enough news emanating from Twinsland, then I heard how Joe Mauer was signing an 8-year, $184 million contract with the Twins. All my dreams about Mauer were shattered. All my coveting Mauer to be the future catcher of the Yankees was for naught. All my hopes that the Twins would be unable to come to agree to terms with Mauer are over and done with. So much for my dreams that the Yankees would get "one for the thumb" with their fifth $20+ million player! When I heard the Mauer news, my reaction was similar to Florida's infamous "Damn, damn, damn" exclamation on "Good Times," although I didn't destroy a punch bowl. Squawker Jon had a field day teasing me about Mauer, as did some Yankee-hating Facebook friends. Even one of our Twitter followers gave me the business, writing to me, "8 years people!! And to all you people who thought #Mauer would be a Yankee! Sing your SWAN song! . :cough cough:." Ouch! Anyhow, Mauer actually keeping with the small-town image and staying with the hometown team is a real shocker. For once, instead of the big star heading for the big city, Mauer is going to stay put in Minny. Bummer. Hope he knows that his chances of hosting "Saturday Night Live" are officially kaput! To top it all off, I read this morning about Johnny Damon has started wearing his 2004 World Series ring again. When will the misery end? Adderall and cocaine and steroids, oh my! Quick programming note: I've written two pieces for The Faster Times about drug use in baseball. First is about Texas Rangers manager Ron Washington, and the silliness of MLB requiring all personnel to be tested for drugs to...keep steroids out of the clubhouse. Read about the curious logic behind the tests. Second piece is about Kansas City Royals catcher Jason Kendall. It's rare that a baseball player not named A-Rod gets the tabloid treatment, but gossip sites have been having a field day with his bitter divorce from wife Chantel. Read the piece to see why he's getting such coverage. And if you want to add my Faster Times writings to your newsreader, go here. Besides, the thing is about being a Yankee is that it puts you in a whole other level of superstardom. Joe Mauer has arguably been the best all-around player in the league for years, but he will only get the attention he deserves if he puts on the pinstripes. Will Mauer get the ads Derek Jeter does if he stays in Minnesota? No. Will Mauer host SNL or get to introduce artists at the American Music Awards as a Twin? Doubtful. Lisa, I concede that no megacontract can fill the hole in one's heart from never having the chance to introduce artists at the American Music Awards. But if being a Yankee "puts you in a whole other level of superstardom," then why did Darryl Strawberry, as you point out, wear a Met jersey on "Celebrity Apprentice"? You see, the 1986 Mets also had a whole other level of superstardom. Lisa, is it a coincidence that just as the Mauer deal was being announced, the Yankees were sending top prospect Jesus Montero to the minors? Now the Yankees actually need Montero to learn how to catch, rather than just hit well enough to be used as trade bait for someone like, say, Joe Mauer. But don't panic if Montero isn't quite ready this year when the aging Posada inevitably breaks down. If Francisco Cervelli can't handle the job, perhaps the Mets can be of assistance. They may not have enough starting pitching, but Omar Minaya cornered the market on backup catchers. Even Mike Jacobs was told to dig out his old catching gear. Want the guy who hit a game-winning homer off Jonathan Papelbon? Omir Santos is available. Want another cult Philly favorite after Sal Fasano? How about Chris Coste? And now Brian Cashman can spin platitudes of how he intends to use the farm system to keep the Yankees on top - at least until Carl Crawford becomes a free agent. Darryl Strawberry: The only reason I'm watching "Celebrity Apprentice"
I'm not exactly a big Donald Trump fan - his hair is annoying, and his business acumen overrated - but I'm watching his "Celebrity Apprentice" show this season for one reason - to see Darryl Strawberry. And while the Mets - or is that Yankees - legend - hasn't been a big part of the first two episodes, he did have an exchange with The Donald tonight that made me laugh. Trump asked Straw about an event for one of the challenges, where the baseball legend posed for photos wearing his Mets jersey. Strawberry said a lot of people asked him why he wasn't wearing a Yankee jersey - after all, he did win three rings with New York. "You were a Met, you were a Yankee," Trump says to Strawberry. "Where is your allegiance?" Spoken like somebody who likes having fans on both sides of the Yankee-Met rivalry! Is Darryl Strawberry a Met or a Yankee? Squawker Jon and I have had this argument a time or two before. I say that the three Yankee rings speak for themselves! Anyhow, I hope Straw plays a bigger part in future episodes, as the rest of the show isn't all that interesting to me. Give me "Tabatha's Salon Takeover" anyday! Squawker Lisa, I see you have noticed that Met blogs have names like "Depressed Met Fan" and "Pessimets," while Yankee blogs have titles like "Pride of the Yankees." But I did uncover one despairing Yankee blog - the E*Trade Baby's "Colicky Yankee Fan." 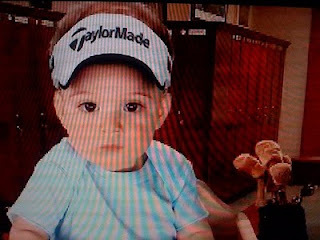 In the blog, the E*Trade baby laments never having seen the Yankees win a World Series. The blog was discontinued last November. If Subway Squawkers was just a Mets blog, I would want to change the name to something like "This Train Is Out of Service. Service Will Resume Later This Evening, or Next Week, or in a Month or Two." Not that I'm pessimistic or depressed or anything about the 2010 Mets. We've been trying to spruce up Subway Squawkers a little by updating our blogroll. Baseball blogs don't exactly have the longest shelf life. As you can see by looking at LoHud.com's Yankee blogroll, new ones sprout up all the time, but many of the bloggers give up after just a few months, as evidenced by clicking on some of those links. So we were adding some new Yankees and Mets blogs, and removing the defunct onces, and I noticed a rather obvious truth - you can tell a lot about a team's fortunes by what their fans' bloggers call their pages. On the other hand, you can tell a little about the despair among the Flushing Faithful by checking out some of the Mets blog names. There's 24 Hours From Suicide...A Day In The Life of a Met Fan, which apparently used to be entitled Long Island Met Fan. There's also Be Gone With Wilpon, Disgruntled Mets Fan, MetsFAIL, and Pessimets. Alas, Depressed Mets Fan is no longer active. Geez, I hope he's okay - or at least got some Prozac! Looks like the blog title "Diary of a Mad Mets Fan" is still available. Somebody needs to start writing that to complete the misery! One other thing I noticed when looking at the Yankee-Mets blog names out there. 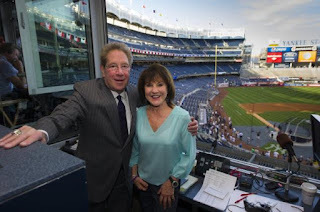 Squawker Jon and I have been writing Subway Squawkers for four years, and we are still the only Yankees-Mets rivalry blog! Cool! I wrote a piece for The Faster Times about ESPN senior writer Buster Olney's ridiculous story about the possibility of the Philadelphia Phillies trading Ryan Howard to the St. Louis Cardinals for Albert Pujols. Olney's article is literally based on nothing more than an anonymous front office discussion in the Phillies front office. The speculation should have stayed there, instead of hitting the front page at ESPN.com, and becoming a breathless story on the Worldwide Leader. Anyhow, my point was that if a blogger wrote anything like what Olney did, based on nothing more than some front office water cooler talk somebody happened to tell the writer about, we'd still be hearing the denunciations from the mainstream media about how completely irresponsible the story was. And if a sports radio caller were to suggest such a deal, he'd get hung up on in mid-dream. As I note in the article, I've taken everything Olney writes with a grain of salt ever since his Last Night of the Yankees Dynasty book, which had Mariano Rivera at Yankee Stadium, not in Arizona's ballpark (the BOB, or whatever they're calling it these days) on the cover. If you're going to suggest that Game 7 of the 2001 World Series was the end of an era, you should show a photo from that night, not one from a victory the week before! What if the Yankees tried to copy the Hideki Matsui Snuggie giveaway? 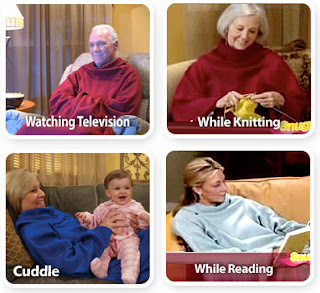 Longtime readers know I'm all about the Snuggie, even if it is a ripoff of the Slanket. So I was all excited to hear that former Yankee Hideki Matsui is the subject of an Anaheim Angels giveaway/stunt involving a Snuggie-like product. On Tuesday April 6, 2010, the Angels will attempt to break the Guinness World Record for the "largest gathering of people wearing fleece blankets." All fans in attendance at the Angels vs. Minnesota Twins game (7:05PM) will receive a complimentary Hideki Matsui Blankie courtesy of Konica Minolta. So, it's not a Snuggie, it's a Blankie. Got it. Squawker Jon just told me he thought the name Blankie was the only thing sillier than Snuggie! I'm envious that the Angels are going to try to break the Cleveland Cavaliers' recent record involving the most number of people to wear this Snuggie-like product at one time (although the Cavs went for the Snuggie, and not the Blankie!) So why aren't the Yankees trying to get in on this action, with a Yankee Blankie giveaway (hey, it even rhymes)? Curtis Granderson, who turns 29 tomorrow, may be new to the Yankees, but he's already becoming one of my very favorite players. Of course, he got a head start on my admiration; last year, he was a blogger for Big League Stew, one of my very favorite sites! Granderson has a bachelor's degree in both busness marketing and business management from the University of Illinois at Chicago. He finished his last year of college on the road, while coming up through the minor league system. Both his parents are school teachers in Chicagoland, and Granderson emphasizes the importance of education in his Grand Kids Foundation. He tells the magazine, "Be smart, and you can still live your dreams." The player is trying to get more African-American youth involved with baseball. "It's a difficult issue partly because baseball is an expensive sport," Granderson says. "So that's one of the things that we are trying to do: cut that cost by providing equipment" to kids. To that end, instead of making money on his "endorsement deals with Nike, Louisville Slugger and Rawlings, Granderson declined a paycheck and asked them to either give money to his foundation or donate equipment to inner-city baseball programs." He also, not long after being traded to the Yankees, arranged to speak with NYC high schoolers via conference call to talk about the importance of education. It's always nice to see a player who embraces being a role model. Here's hoping Granderson has a grand season for the Yankees! This month marks the fourth anniversary of Subway Squawkers. And Yankee fan Julie Amedio was one of the very first readers that we heard from. Back then, we weren't even in a blog format, so our only feedback was via email. And we'd hear from Julie several times a week. Unlike many fans (including yours truly! ), there was no trash talk in Julie, no denigrating of the opposition or anything else - she always had nice and kind things to say about everybody. We didn't know all that much about Julie on a personal basis, other than that she lived in the Albany area, worked for state government there, and came across as a very nice person. But we heard from her many, many times over the years, both on the blog, and in email, talking about the Yankees. In particular, I remember her being very sad about Cory Lidle's death. I also remember how even during the Subway Series games, she'd find nice things to say about the Mets. And when I was diagnosed with Graves' Disease, she was one of the first readers to contact me and send positive thoughts and prayers my way. So when Jon and I moved to SubwaySquawkers.com in November 2008, Julie was one of the first people I reached out to about our new location. Unfortunately, we never heard back from her. And we never saw her post again. I wondered what had happened, and why one of our most loyal readers just disappeared for good like that. Was it something I said? It saddened me that she never commented again. About a month later, I emailed her again at her work address, but I never heard back. And I never knew what happened - until this morning. Anyhow, I got to thinking about Julie today, as we heard from Noreen, Fred, and Sully, three of our longtime Red Sox readers, in my Nomar thread. So this morning, I decided to reach out to Julie, and tell her we missed her comments. The email bounced back, so I decided to Google her and see if I could find current contact information. Unfortunately, I found out some very sad news, and I'm teary-eyed while writing this now. It turns out that Julie died in November 2008 at the age of 25. Here's her obituary, and more information on what happened. She literally took ill and died right around the time that we moved to the new blog location. She possessed a remarkable love of life, and instilled that emotion in everyone she met, seeing only the positive side of everyone....Julie was a kind, pure individual, and all those whose lives she touched are the better for it. Her legacy is that she provided an example about how to live and enjoy the precious gift of life. Poor Julie - she was only 25 years old. She didn't even get to live long enough to see her beloved Yankees win the World Series last year. It's so sad to think that somebody who loved life so much was taken from the world at such a young age. I don't even know what to say, other than to say that we miss her presence on the Subway Squawkers blog very much. Our hearts go out to her family and friends on their loss. Do you remember Julie? If so, tell us about it in our comments section! So why hasn't Joe Mauer signed that big deal with the Twins yet? I make no secret of the fact that I openly covet Joe Mauer, and want him to be a Yankee next year. In fact, I fully expect that he will be wearing the pinstripes next year - I wrote several columns about this last winter. 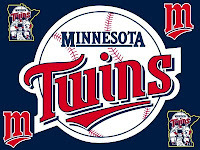 Anyhow, I got all sorts of grief from readers - and Twins bloggers - telling me about Joe's a small-town guy, he wants to stay in Minnesota, and he will stay in his home state, blah blah blah. And there was all sorts of talk this winter about how the Twins would lock him up with a long-term deal. Yet here it is, mid-March, and Mauer still hasn't agreed to that big contract with the Twins. So Minnesota Star-Tribune columnist Jim Souhan (hat tip to Sliding Into Home) is now wondering if "Mauer's hesitancy to accept a record-setting contract offer from his hometown team has made his signing less than a sure thing and raised this previously unthinkable question: 'Won't the Twins have to trade him if he refuses their best offer?'" If he's spurning amounts the Twins feel are exorbitant, the team could discern that Mauer is intent on playing in New York or Boston. Those might be the only two baseball cities where a team other than the Twins would be willing to pay more than $20 million a year for a catcher with a history of leg and back injuries. At some point, the Twins' attitude will change from eagerness to sign Mauer, to indignation that he won't accept a franchise-record offer. If Mauer doesn't have that big deal from the Twins by Opening Day, start spreading the news. 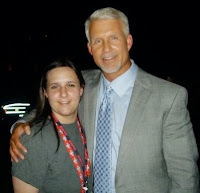 He will be a Yankee in 2011! Writer/editor/Yankee fan extraordinaire Cecilia Tan of Why I Like Baseball fame was nice enough to get Squawker Jon and me copies of the Maple Street Press annuals on the Yankees and the Mets. (She edited the Yankee edition.) 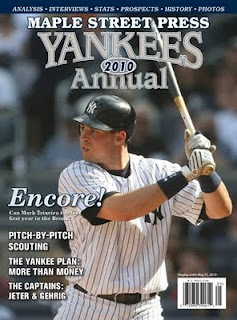 Here's my look at the Yankee annual for 2010. The Maple Street Press annuals are kind of like a magazine, yearbook, and reference guide all in one. There are also a ton of great articles, all well worth leading, from writers Howard Megdal, E.J. Fagan, Vince Gennaro, Dan McCourt, Keith R.A. Candido, Joe McDonald, Wayne McDonnell, Greg Fertel, Cecilia Tan, Matthew Sisson, Chip Greene, Louise Herring-Jones, Ron Kaplan, Dan Graziano, Mark Healey, and David Vincent. * Dan Graziano's "2009: A Yankee Year." Graziano was one of my favorite Yankee writers when he covered the team for the Star-Ledger, and it was a real treat to read his article about the many turning points - and twists and turns - of the 2009 season. It made me wish that he was writing on the Yankees full-time again! * Mark Healey's "The Making of a Manager": This was a look back at Joe Girardi's season, and his most controversial moves. The article talks about how the media criticized Girardi going to a three-man rotation in the playoffs, and noted one critic who pointed out how neither Burnett and Pettitte had shown that they could pitch well on three days' rest. That naysayer was Squawker Jon! The article called him "Josh Lewin" - I think the writer may have confused Jon's name with the baseball broadcaster Josh Lewin - but it mentions Subway Squawkers, which is awesome! * Ron Kaplan's "Koshering the Yankees: A Trip to Fantasy Camp": Ever wonder what it's like at Yankee Fantasy Camp? Kaplan has the scoop - but with a twist. He attended an special edition of the camp last winter that featured "exciting Kosher and Shabbat options" for Orthodox Jewish fantasy campers. It's a fun article to read because it gives you insight as to what the fantasy camp experience is like. Anyhow, the Maple Street Annual is $12.99, and available at bookstores, or by going to the Maple Street Press website. It's good stuff - I got so engrossed in the magazine that this Subway Squawker nearly missed my subway stop while reading it! Squawker Lisa, while you are throwing up over Red Sox Nation embracing Nomar Garciaparra as he signs a one-day contract so he can retire in a Red Sox uniform, I say, good for them. Unlike the Yankees, who have had so many great players that some of them have to share retired numbers, most teams have far fewer fan favorites to celebrate. And while the Red Sox do seem to trash most of their stars as they are leaving town, even the most beloved stars rarely get to leave on their own terms. Even a Bernie Williams had an awkward parting with the Yankees. For years, the Mets organization distanced themselves from Dwight Gooden and failed to embrace Darryl Strawberry, Davey Johnson and Frank Cashen. Some Mets fans (including me) looked back at Gooden, and to a lesser extent, Strawberry, and lamented what might have been rather than celebrating what actually happened. Now, almost a quarter-century after 1986, these cornerstones of the title team are finally being inducted into the Mets Hall of Fame. And I know I will have at least one game to look forward to this year. The player whose farewell I am most looking forward to is Johnny Damon's. In the morning, he would appear, clean-shaven, in the Bronx, professing his love for all things Yankee. In the afternoon, Damon would roll into Fenway, remove the false chin and short-hair wig to once again sport the caveman look. Unfortunately, Damon's agent, Scott Boras, would want to award Damon's one-day retirement contract to the highest bidder, which is why we could well see Damon getting all teary at a news conference in Kansas City, pointing out that they gave him his start and he played more seasons there than anywhere else. * And finally, notice how the Boston Red Sox ownership team will conveniently forget the part they played in trashing Nomar's reputation in the media - feeding negative stories to the press, etc. Yes, yes, I know about the awful things George Steinbrenner did to players in his heyday. The difference is that he suffered real consequences for it. So please, spare me all the tearful "We love Nomah" hosannas out of Boston. The Sox could have simply traded him in 2004 and taken the high road. Instead, they had their minions trash the man who was once the face of the franchise ten ways to Tuesday. And Boston fans could have simply been happy with winning the 2004 World Series. Instead, they spent way too much time pointing fingers at Nomar. Classy! Why is Ronan Tynan shipping up to Boston? I was watching a PBS special this weekend called "The Music of Ireland - Welcome Home," which featured Irish tenor Ronan Tynan, among other artists, talking about the history of Irish music. Anyhow, I wondered what Tynan was doing these days, ever since he got the heave-ho from Yankeeland due to reportedly making an anti-Semitic remark last fall. I didn't have to wonder long about Tynan. The next day's New York Times had a big story on the singer, in which he revealed that he's moving to Boston! Of course, now there's all sorts of speculation that the Irish Tenor member might switch sides and sing "God Bless America" at Fenway Park. I hope the Red Sox don't get some kind of crazy ideas about letting him sing at Fenway Park. The Sox have had plenty of fine musicians at Fenway, like James Taylor and Dropkick Murphys, belting out the tunes. There are plenty of ways the Sox can stick it to the Yankees, but I hope they don't think that bringing in Tynan for "God Bless America" is a good idea. Is Tynan truly a bigot? I don't know for sure, but he's gotten too much bad publicity recently for this to be anything but a silly publicity stunt should he be invited to sing at Fenway. Anything that would bring Red Sox Nation angst is fine with me. So part of me would like to see Tynan sing at Fenway, just to make Boston fans uncomfortable. Sing it, Ronan! I just don't want anybody in Boston to talk about trading musicians. I have zero interest in hearing the creepy "Sweet Caroline" at Yankee Stadium, that's for sure! * I'm very disappointed in Barry Zito for not coming up with something more creative to avenge Prince Fielder bowling over the Giants. So in a piece for The Faster Times, I wrote some suggestions of what he could have done. * My latest Baseball Reflections article is up, where I talk about what I think about the Yankees' offseason moves. Please check these articles out! Does one New York baseball writer have a grudge against Darryl Strawberry? Anyhow, Straw's comments gave the baseball blogosphere something to squawk about (more on that in a sec.) But it's what Klapisch also included in the article that might be even more telling. As I uploaded pictures and surfed the web, I listened to the New York media chatter. Two guys were discussing Bob Klapisch's piece about Darryl Strawberry from Saturday. They were convinced that Klapisch included all the bits about Strawberry smoking and his gut and everything as a way of getting back for some dismissive things Straw said to Klapisch during their interview. "Bob's just killing Darryl," one of the guys said as he read, "he must have been pissed off." Darryl Strawberry is headed toward the clubhouse door, an unlit Newport jammed between his fingers. Strawberry delivers this public-service announcement without apologies or PC embarrassment. He’s a cancer survivor, a recovering addict, not to mention one of the fittest, strongest players of his era. Darryl should be an anti-nicotine zealot but that doesn’t stop him from lighting up and filling the air with those lazy blue curls. Hollywood has learned that the quickest way to emphasize that somebody is a bad guy is to show them with a cigarette in his mouth. Is this sportswriter trying to do the same thing, with his repeated reference to Strawberry's smoking? I wonder, given the way Klapisch goes on and on about the smoking. Shocker - an ex-ballplayer uses tobacco! Next thing you'll tell me that baseball players like to chew tobacco during games. Klapisch also repeatedly talks about Strawberry being out of shape, with frequent references to his "paunch." What, an ex-athlete in his 40s isn't in the same physical condition that he was in during his prime? Stop the presses! Guess Klapisch hasn't paid much attention to what old ballplayers look like during Old Timers' Day. I also wonder if Klapisch really understands Strawberry's mindset. The ballplayer is somebody who battled cancer - twice - before he was 40 years old, and who battled drug and alcohol addictions that short-circuited his career. My guess is, like many recovering addicts, Strawberry smokes as the lesser of two - make that three - evils. And given his health history, the fear of, say, cancer isn't going to scare him into quitting smoking the way it might other people. Besides, quitting tobacco is hard, hard stuff, as I know from personal experience, and as anybody who's had a dying relative who persisted in smoking can attest to. Heck, our president still hasn't managed to give up tobacco! Klapisch did elicit some other interesting quotes from Strawberry's about the '86 Mets, but he would have served the player - and the readers - better if he had stuck to running those quotes, and skipped the health editorializing. As for Straw's '86 Mets vs. '09 Yankees comparison, Kevin Kaduk of Big League Stew ran the numbers, courtesy of WhatIfSports. The result - the Yankees would win in a head-to-head matchup. Squawker Jon will not be happy to hear that! Some of the ailments that baseball players suffer from are not stuff I ever have to worry about coming down with. For example, no matter how much time I spend at the computer, I'll never need Tommy John surgery! But Jose Reyes' thyroid issue is something I am painfully familiar with. I was diagnosed with hyperthyroidism three years ago. In the winter of 2007, my primary care physician noticed after a routine blood test that my thyroid numbers were very low. (Paradoxically, low numbers in this test indicate an overactive, not underactive, thyroid.) As we were very busy at my job at the time with a site redesign, I put off doing a followup visit right away. Besides, I felt fine at the time of the test results, so I didn't see that it was that big a deal. I just assumed that the number was off for some trivial reason. Big mistake. Even though the thyroid is a a relatively small gland (it's located just below the larynx), if it's not working correctly, it will cause all sorts of mayhem with the rest of your body. This is something I quickly learned. In the two months after that initial blood test, I gradually became weaker and weaker, to the point where I literally got winded just walking from my car to my house. I also felt physically hot all the time, even in the dead of winter. My vision was getting very blurry. I was extremely irritable - even more than I usually am! And I was starting to have heart palpitations. It was a scary time for me, because I had no idea what was going on. When I finally went back to my doctor, he took some more tests and diagnosed me with hyperthyroidism. But we didn't know what was causing it. So he sent me to an endocrinologist (a specialist in, among other things, thyroid disorders), who figured out that it was Graves' Disease, one of several things that can cause hyperthyroidism. The specialist put me on medication to get my thyroid back to normal; the first set of drugs didn't work as quickly as I hoped, and I was worried that I would need to get my thyroid removed or treated with radiation if things didn't improve. Fortunately, the second brand of medicine worked well. And by that July, my thyroid was finally back to normal levels, my Graves' Disease went into remission, and my energy and health levels greatly improved. The Graves' Disease is still in remission now, but I visit the doctor 3-4 times a year to make sure it's staying that way! * Reyes was diagnosed very early with a thyroid imbalance. It would have been much worse if it took him feeling weak for the Mets' medical staff to figure out something was wrong. * If the diagnosis turns out to be hyperthyroidism - or for that matter, hypothyroidism - it is treatable. In many cases, simply taking medication will correct the thyroid levels. * There's still a month for the regular season to start, so Reyes and the medical staff will have some time to get him started on the road to recovery, and figure out what's causing the thyroid issues. Anyhow, that's my story. Best wishes to Reyes as he waits to hear exactly what's happening with his health. Of all the moves that Brian Cashman made this winter, bringing back former Yankee Nick Johnson was one of his worst, given the player's propensity for injury. Why Cash would bring him back I will never understand. I don't care how good Johnson's OBP is - he will never be able to stay healthy enough in order to put his ability to draw walks to good use. Anyhow, I was planning on doing a Subway Squawker pool, where we'd pick a date for when Nick Johnson would get his first injury, and venture a guess as to what he would hurt. Too late. Exactly one game into the Grapefruit League season, Johnson got hurt. He suffered a back strain Thursday, and was scratched from the Yankees' second spring training game. Johnson said that he tweaked his back after catching a spike in a turf mat around the batting cage at Bright House Field. Had it been the regular season, Johnson said he would have played "for sure." Oh great. 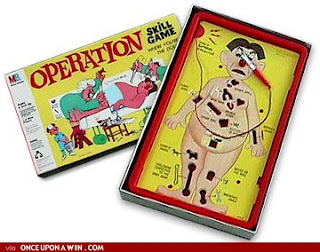 Johnson has Carl Pavano's propensity for freak accidents. Boy, I'm glad the Yankees passed on re-signing that creaky old Johnny Damon for this picture of health! He strained his left wrist in 2002, fractured his right hand in 2003, broke his cheekbone in 2004, and suffered a right heel contusion in 2005. All required a trip to the 15-day disabled list. In 2006, a violent collision with teammate Austin Kearns fractured Johnson's right femur, forcing him to miss the end of that season and all of the next season. In 2008 he had season-ending surgery to repair the tendon sheath in his right wrist, and in 2009 he went on the DL with a strained right hamstring. All told, Johnson has been on the 15-day disabled list nine times, and been transferred to the 60-day disabled list four times. He's played more than 133 games in a season only once, and played fewer than 100 games four times. It would be great if Johnson's back strain was just a momentary blip, but I'm afraid this is going to be the first of many injuries this year. Come to think of it, why didn't the Mets sign Nick to play first base for them? He'd fit right in with that crew! If only Ken Burns had more "Baseball" episodes. MLB Network had been showing the classic series on Thursday nights over the last few weeks. But tonight, they aired Yankees-Phillies. CC Sabathia against Roy Halladay. Met fans can look forward to a better year in Queens just on the basis of fewer injuries (we hope). But the misery at the end of the year is not going away. The Yankees and Phillies are still the defending pennant winners, and are favored to repeat. I could not bring myself to watch much of the game, so I do not know if anyone explained that it was a day game being shown on tape delay. Or maybe they let viewers think that the sun is always shining on the Yankees and Phillies. So what if Halladay was making his Phillies debut. The Mets also had a starter making his debut with the team - R.A. Dickey. Halladay and Dickey were both were first-round picks in the middle of the round in the mid-1990s. Halladay went 17th overall in 1995 and Dickey went 18th in 1996. Dickey does have one thing going for him, however. He will never have to undergo Tommy John surgery to repair the ulnar collateral ligament in his pitching elbow - because he does not have one. 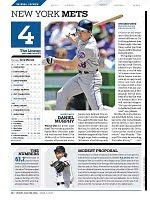 As the Star-Ledger's Brian Costa notes, what better pitcher for the 2010 "Prevention & Recovery" Mets? Now the Mets just have to find a backup shortstop who is missing a hamstring tendon. Derek Jeter: Future Yankee owner? A few days ago, I called into the MLB Home Plate station on XM Radio to participate in a discussion about Derek Jeter's contract situation. Host Holden Kushner was insistent that Jeter needed to be paid more than Alex Rodriguez, even if it were only a dollar more, to signify his worth to the team. I respectfully disagreed, saying that if Jeter weren't worth as much as A-Rod at age 26, coming off four World Series titles in his first five years, he wasn't worth it now. Although the captain means so much to the Yankee franchise's fan base, so do Mariano Rivera and Jorge Posada. Do they need to make more than Rodriguez as well to prove that point? Besides, I noted, A-Rod's contract was ridiculously high, and the Yanks should never have given him that kind of money. Why compound that mistake by giving another player even more money? Anyhow, I'm reminded of this discussion - and of the whole Jeter contract situation - after reading this morning's New York Post, where Kevin Kernan has upped the ante on the "What is Jeter worth?" discussion. According to the columnist, the only way the Yanks can truly keep Derek Jeter as a "Yankee for Life" is to make him a part owner of the team. That's right - a retired number isn't enough. Monument Park isn't enough. It's owner or bust, baby. The Yankees and Jeter will come together on a new deal at some point, but Jeter needs to be a Yankee for Life and there is a way to make him one. The Yankees need to work out a deal with Jeter where they allow him to become part of Yankees ownership after his playing days are complete. Players cannot be part of ownership, so this would have to be a separate deal. As it stands now, most certainly, Jeter will follow the player-to-ownership path of Michael Jordan. Jordan should have been with the Bulls for life, but wound up a Wizard at the end of his playing career and over the weekend became principal owner of the Charlotte Bobcats. The Michael Jordan analogy actually makes the case against players being owners. Jordan retired as a Bull in the most perfect way possible - making the final shot to win his sixth ring with the team. Yet he tainted his legacy by unretiring to play past his prime, in no small part because he was a part owner of the Washington Wizards. And as part owner of the Charlotte Bobcats, he was behind drafting the tearful Adam Morrison, among other not-so-great decisions. Jordan was the greatest NBA player of all time, but he's been mediocre at best as an owner so far. Is that really a record to emulate? Yet Kernan insists that having Jeter as a Yankee owner is a great idea. "There never will be another George Steinbrenner," he writes, "but imagine the buzz of having Jeter as part of the ownership group. He could be Boss II. What better owner could the Yankees have than Jeter?" I know Jeter wants to be an owner one day, but Kernan fails to realize what a circus it will be for everybody involved if the captain becomes a Yankee partial owner, especially if it's just after his retirement as a player. The media will scrutinize every single decision the Yankees make - from spring training hats to player development choices - to see if it's what Jeter wants. It will be impossible for Brian Cashman or anybody else in the franchise to make any independent choices. How could that possibly be a good thing, especially since none of us know yet what Jeter's skill set would be as an owner? Being a great player does not translate into being a great coach or manager or owner, after all. No, Kernan's column is just upping the ante on the already over-the-top media coverage of Jeter. Besides, the Steinbrenner sons have made it clear that they weren't going to put an untouchable Yankee legend in a position of authority when they passed on having Don Mattingly be Joe Torre's successor. And their father George suffered a huge PR hit when Yogi Berra stayed away from Yankeeland for fifteen years after being fired as manager. So why would the Steinbrenner family effectively give the team to Jeter, somebody even more untouchable among the fan base than Mattingly and Berra? It makes no sense. The Yankees don't need to give Derek Jeter the moon and the stars to make him a Yankee for Life - just a new contract as a player.